Before we get into anything and everything about this great game, how awesome is that picture, huh? That makes it seven wins in a row for the Providence Friars over the Rhode Island Rams in the Ocean State Rivalry for Rhode Island supremacy. As with the majority of the matchups between these two teams, you can pretty much throw the records out at the door and prepare yourself for a down-to-the-wire rock fight with some high intensity. 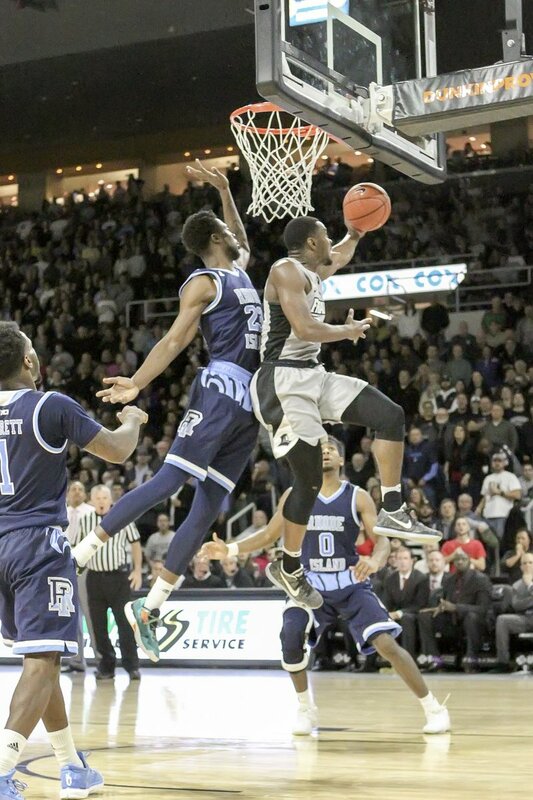 The Friars were able to pull out a late win behind perhaps the best game of Kyron Cartwright’s time as a Friar. Cartwright was made for these kind of games. He finished with a career-high 17 points to go with a game-high 8 assists, 4 rebounds, 1 steal, and only 1 turnover. He was able to keep the Friars close in the first half while leading scorer Rodney Bullock was taking a while to find his offensive groove in the game and continually delivered the correct pass at every pivotal moment of the game. Bullock came through in the second half, eventually finishing with 17 points and Jalen Lindsey was fantastic once again on both sides of the floor, chipping in 13 points of his own, including a clutch jumper off the dribble down the stretch. Isaiah Jackson started of Ryan Fazekas, most likely because Cooley wanted Jackson on the floor defensively for the Friars. Fazekas held his own on the defensive end in the 2nd half and earned himself all of the important big time minutes. At first I couldn’t tell if I hated some of the URI players just because they were URI players or if I really hated some of them, but boy oh boy, do I hate Jarvis Terrell. How about that Kyron Cartwright heat check in the first half (4-5 from three). 9 Turnovers in the first half hurt the Friars and put them down by 6 going into halftime. I expected Ed Cooley to cut down his rotation in this game but he went 10 deep just in the first half alone. Some of that was due to Holt and Lindsey picking up a pair of fouls each but when Cartwright came out of the game, the Friars offense completely fell apart with having to have one of Diallo, White, or Edwards run the team offensively. The 2nd half rotation was more along the lines of how I was expecting Cooley to approach this game from a substitution prospective. Diallo and White found their way to the bench and Edwards saw a couple quick appearances. Where do I even start with Kyron Cartwright. I think my favorite stat of the game is that Cartwright finished with 8 assists and URI, as a team, finished with only 6 assists. That stat alone tells you so much about how these two teams play. Plus, he only coughed up one turnover as well. Cartwright drained 4 of the 6 threes he took on the game and finished 6-12 from the field. He has really come leaps and bounds from his Freshman year when he shot just 4-33 (12.1%) from three point land. He shot a respectable 36.4% last year and is all the way up to 44.4% this year. His hard work has really paid off. His aggressiveness and confidence really helped the Friars in the first half, including a nasty 1-on-1 take and strut back on D.
And he basically matched the impressive take with a devilish hesitation move and finish in the 2nd half. And yet another amazingly captured finish. Jalen Lindsey continues to impress me with his growth this year. I don’t remember him even attempting 2-point shots that weren’t dunks last year and he came up with two big jumpers in this game. The one jumper at the end of the game was clutch as hell and basically a picture-perfect move from Lindsey. Rodney Bullock took a little time to get going but once he found his stride in the 2nd half, he was the difference in the game. Bullock finished with 17 points on 5-11 shooting and was able to get to the line 10 times, making that two games in a row with double-digit free throws for the emerging star. Did I mention the dunk at the end of the game yet? No? Well, here it is (and what a find from Cartwright). With the 17 point performance, Bullock is now averaging 21.4 point per game this season. Bullock currently leads all Big East players in scoring. 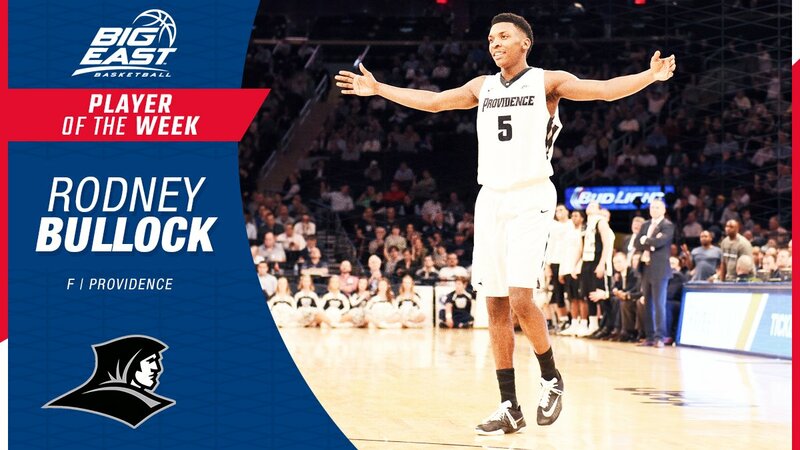 With another great game out of Rodney Bullock, he was selected as the Big East Player of the Week. Bullock averaged 26.5 ppg for the week. I know that Emmitt Holt is a transfer from Indiana, but that guy was MEANT to play at Providence College. You can just tell that he embraces the culture here and plays with a passion and energy that embodies this Friars team and Coach Cooley. 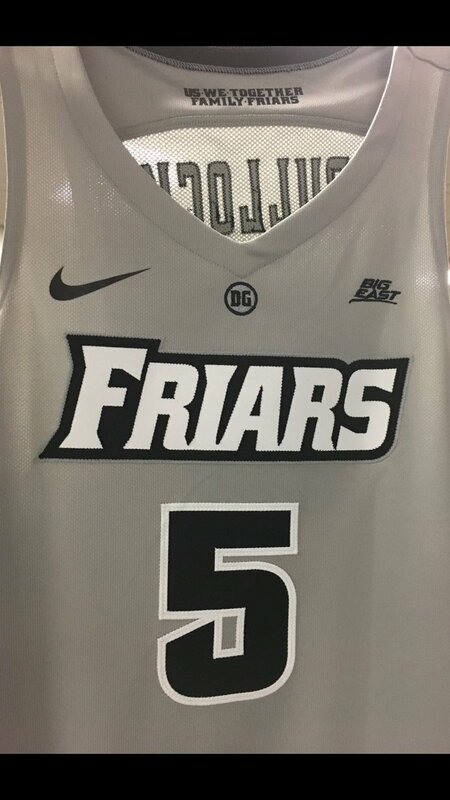 About that culture, I couldn’t love the inside of the Friars jerseys more if I tried. Kalif Young is agile for his size and runs the floor extremely well for a big guy. I think that’s my favorite thing about him from watching him so far. I just like what Isaiah Jackson brings to the table as a kind of ying to Ryan Fazekas’ yang so that the Friars can show different looks as a team when interchanging those two guys. As for URI, the only guy that I was continually worried about was Hassan Martin. Martin finished tied for the team-high in points with 14 (with Jarvis Terrell) and a game-high 17 rebounds, 6 on the offensive end. He was a terror on the boards and also had two impressive blocks. The fact that he only got 10 shots (and went 5-10) seems low for how many looks he should be getting. EC Matthews was not the type of player that he was hyped up to be from his missing last season. Everyone kept saying how if they had him they would have been a totally different team and way better. Matthews shot just 3-13 for the game, including 1-8 from three and chipped in 0 assists. You can’t really judge a player from just one individual game, but man was that an uninspiring performance out of Matthews in a big time game. PC was able to hold URI to 37.3% shooting from the field and 27.8% from three. Providence has been very impressive from a defensive standpoint so far this season. Next Game: PC Friars continue their home stand against another in-state foe, Brown, at 7 PM at the Dunk on Tuesday 12/6.